Gyllyng Hall is close to Falmouth's town centre, colleges, harbour side and amenities, occupying an elevated position above the town with some broken views of Penryn river and beyond. Recently uplifted this spacious ground floor two bedroomed flat has an outstanding 21' 5" x 16' 11" living room and superb kitchen/diner. THE LOCATION Gyllyng Street is a lovely old no though road, tucked above and just a few minutes walk from Church Street, the town and waterfront. The position is relatively traffic free but convenient, where so much of what delights about Falmouth is on one's doorstep. New Street and Gyllyng Street run parallel with Arwenack Street, the main thoroughfare through the town, and consequently the town's excellent range of shops, services and leisure amenities are literally 'on the doorstep'. Custom House Quay, the harbourside, Event Square and National Maritime Museum are also just a few minutes walk away, thus making this an ideal location for investment, permanent and second home purchasers alike. THE PROPERTY Set in a highly advantageous location, Gyllyng Hall is close to Falmouth's town centre, colleges, harbour side and amenities, occupying an elevated position above the town with broken views of Penryn river. 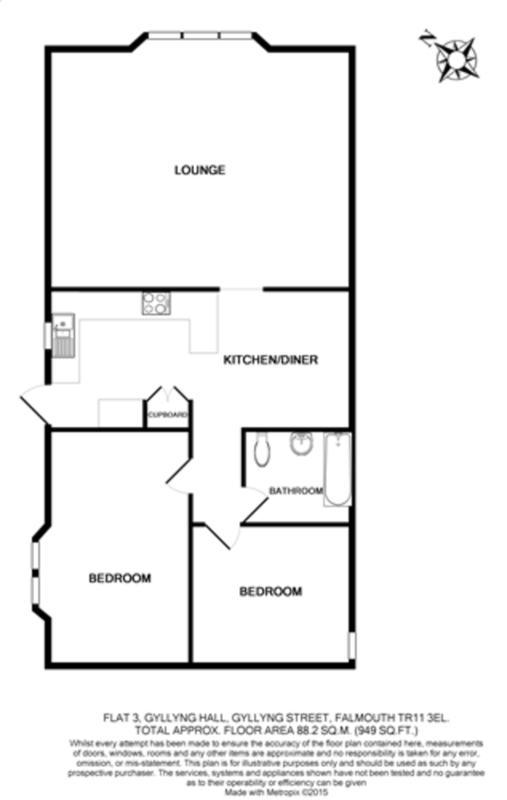 This spacious ground floor flat benefits from an outstanding living room measuring 21' 5" x 16' 11". It also has two double bedrooms within the handsome period building which has managed to retaining many unique and original features. This historic building was converted into residential apartments from 1997 and has steadily been improved over the years. KITCHEN/DINER 21' 7" x 9' 10" (6.58m x 3m) Recently refitted with white cupboard doors and draws to the base and eye level units. Hard wood worksurface has an inset one and a half bowl sink and drainer with a four burner gas hob and built-in fan assisted double oven. Combination Worcester boiler. Space for washing machine. Side aspect window and dining area with new bench seating and storage beneath, radiator. LIVING ROOM 21' 5" x 16' 11" (6.53m x 5.16m) Light and extraordinarily spacious living room with three beautiful windows to the front aspect providing the room with river glimpses. Radiator. Power points and TV point. SMALL HALLWAY Linking family bathroom and two double bedrooms. BATHROOM 7' 3" x 6' 4" (2.21m x 1.93m) White suite with low level push button flush WC, white pedestal wash hand basin, deep wide bath with shower connected to the main boiler. Radiator. BEDROOM ONE 16' 7" x 10' (5.05m x 3.05m) This room has a side aspect double window with double glazed hardwood. Power points and radiator. BEDROOM TWO 10' 11" x 9' 9" (3.33m x 2.97m) Side aspect hardwood double glazed window. Power points and radiator. OUTSIDE There is a raised narrow patio to the front aspect, providing enough space for chairs and a table.